Curley Knights become Pace Spartans: One year after Archbishop Curley Notre Dame High closed its doors, its students who transferred to Msgr. Edward Pace High feel at home. From left: Christie Corolian, Tajmara Antoine, Saskia Magloure and Justane Pierre. MIAMI GARDENS| As a freshman, it is nerve-wrecking enough to navigate around a new school where everything from the campus to the teachers and students are unfamiliar. Imagine having to do so again as a sophomore, junior or senior? This is what junior Christie Corolian, seniors Saskia Magloure and Justane Pierre, and alumnus Tajmara Antoine, along with 89 other peers from Archbishop Curley-Notre Dame High, faced as the new kids at Msgr. Edward Pace High School last fall. 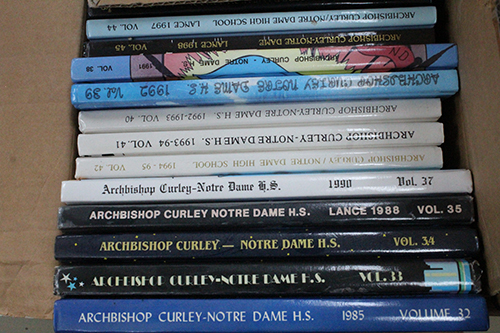 Dozens of yearbooks from Archbishop Curley Notre Dame High are now housed at Msgr. Edward Pace High, where they will be kept in the memorabilia room. A Curley Knight mascot that once stood in Archbishop Curley Notre Dame High now stands among Msgr. Edward Pace High memorabilia. 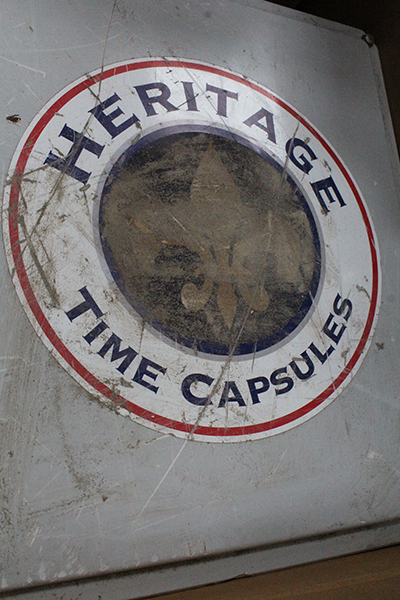 Among the Archbishop Curley Notre Dame High memorabilia is a time capsule. After Curley-Notre Dame closed in 2017, students had the options of attending public or charter schools or continuing their Catholic education at Pace, the archdiocesan-designated merger school. Most students chose Pace as their new home. But starting over is never easy. It proved to be especially stressful for Tajmara because not only was she adjusting to a new school as a senior, she also had to start college applications, prep for college entrance exams, and maintain a GPA under a different system than the one used at Curley-Notre Dame. She said she often felt that after graduation she would be forgotten, having left no mark for anyone to remember her one year at Pace. Looking back, she couldn’t believe how wrong she was. “I really didn’t expect that I was going to actually like the school like I did. This is a big school, so I wasn’t expecting to get to know the teachers so well, but that was the opposite, especially with teachers like Dr. (David) Masters and Mrs. (Yvette) De La Vega. I really think the teachers give you a strong support system,” said Tajmara. 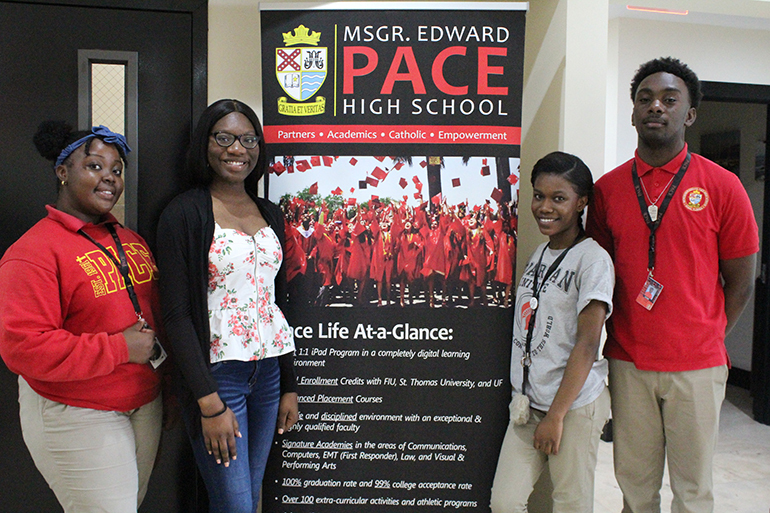 While Christie improved academically, she also had the opportunity to reconnect with some friends from St. Mary’s Cathedral School who chose Pace as their high school instead of Curley-Notre Dame. “I’ve known some of them since kindergarten,” she said. As the rest of the year played out, Christie, Saskia, Justane and Tajmara admit that they enjoyed themselves and truly made Pace their own. “This is proof that schools can get together and transition and work out okay,” said Saskia. In Pace’s memorabilia room, some remodeling is under way to make room for Curley-Notre Dame’s own memorabilia, which Principal Doug Romanik passed on to Pace’s Principal Ana Garcia. 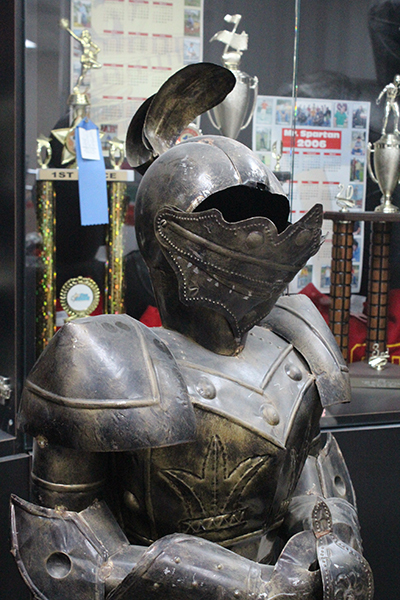 There are decades of yearbooks, photos, plaques, crests, jerseys and more, along with two life-size knights, which have become a popular selfie attraction with Pace students. In May, Pace graduated its first class of Curley-Notre Dame students, with Tajmara and three other Knights graduating with a 4.8 GPA or higher, the equivalent of the top 10 percent of their class. All are college bound. The remaining Knights are looking for ways to leave their mark as Spartans.